Ricart realized that adapting their unique aerodynamic form to his advanced chassis could give his new cars a significant performance advantage over similar competitors that were just starting to emerge from the rubble of the previous years. What he needed most to complete the body’s design to his demanding expectations was an engineer/artist who could transform his ideas into reality. The best and most recognized designers of the time were in Italy, but Ricart wanted his new coupe to be entirely Spanish in origin. The era’s common wisdom for aerodynamic efficiency in automobiles had been originally promulgated in the late ’20s by Hungarian aerodynamicist Paul Jaray, who had developed his formula for minimum drag by mathematically calculating the shapes for Germany’s futuristic Zeppelins. He decreed that the most efficient shape should follow nature in the form of a raindrop with a long, graceful, tapering tail. Jaray’s patented streamline concepts were dutifully followed by manufacturers all over the world for decades, and were best exemplified by the French coachbuilders of the late ’30s who produced designs that are even today considered the epitome of elegance. 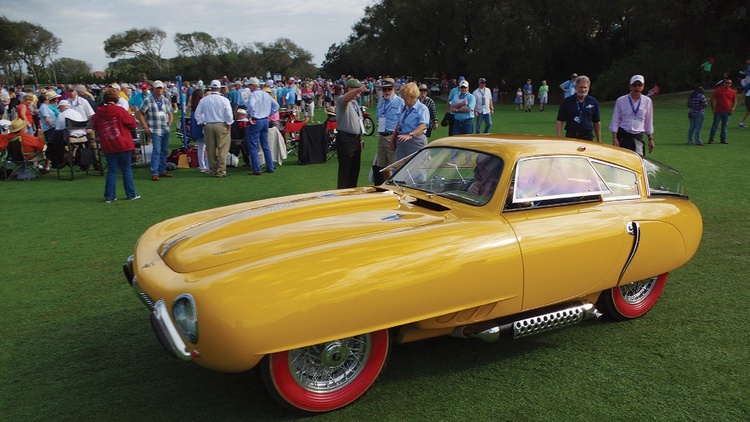 Elegance, however, does not necessarily deliver the most efficient performance for racing, and that was Ricart’s goal for his new Pegaso. About the same time as the best French “carrosseries” were perfecting their Jaray-influenced masterpieces, two brilliant, iconoclastic German aerodynamicists, Reinhard von Koenig-Fachsenfeld and Wunibald Kamm, discovered that a slight taper to a much flatter roof line, combined with a severely truncated tail, actually offered the least aerodynamic drag. The only problem, at least with the uneducated, was that this rather different form appeared visually heavy and seemed to aesthetically contradict everything that had been ingrained in the public’s mind because of Jaray’s decades of influence. A number of German manufacturers even had Kamm and Koenig-Fachsenfeld build prototypes to test both fuel efficiency and public reaction to their unique form. Not surprisingly, these controversial prototypes were significantly more efficient than other production shapes of the mid-’30s, but were still roundly rejected by conservative managements who rightly considered these new lines far too different from conventional practice for public acceptance. 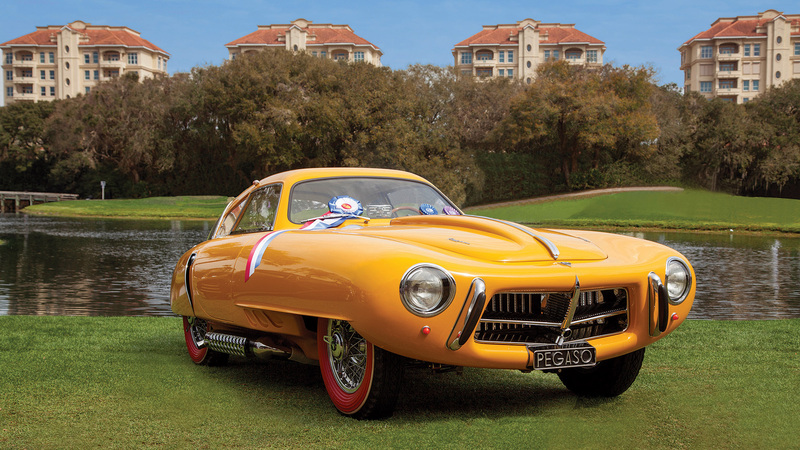 Ricart’s mind-blowing Pegaso coupe, which re-debuted in New York with wild yellow livery, red sidewall tires and an equally controversial pale green interior, was actually penned by a young Spanish staff designer at Pegaso named Augustine Masgrau. Ricart took Masgrau’s drawings to Italy, knowing that the Italian artisans could probably build his new design more efficiently, but still had some reservations with that plan because it would mean the car wouldn’t be entirely Spanish in origin. Ricart had ordered some 80 copies of his Z102 chassis to be unit-constructed in Spain, but he still planned to produce the bodies for them in Italy. 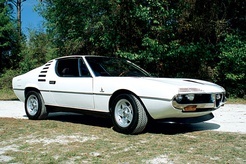 His decision to go with a series of more conventional forms by Touring in Italy was based on his certainty that his elite clientele would more readily accept the famed Italian carmaker’s designs. But that still didn’t cool his passion for what Masgrau had drawn. Ricart returned to Spain with the young Spaniard’s sketches and proceeded to build his concept at ENASA, Pegaso’s parent company. Beneath Masgrau’s futuristic lines, Ricart had designed and built one of the most advanced GT chassis the world had ever seen, with a 2.8-liter DOHC V8 coupled to a five-speed transmission located behind the differential, and complete with de-Dion rear suspension. Unfortunately, a lack of proper material at that time meant the result was far heavier than he had planned. Still, with a speed of 155 mph in testing, it soon proved even faster than the most powerful Mercedes and Ferraris of the day–making it, at least for a few weeks, the fastest GT in the world! Raphael Trujillo entered his Cupula in the third Mexican Carrera Panamericana, but it never made the starting grid; instead, the factory convinced him to back a roadster effort for 1954. “El Dominicano,” as the Pegaso roadster was named locally, was very fast, but unfortunately it crashed heavily; Mercedes again won the GT class. The car’s remains were taken back to the island nation and stored there with the Cupula until Trujillo’s assassination in 1961. Then, in ’76, after protracted arrangements, the scraps were acquired by a group of enthusiasts in Puerto Rico, New York and even Mexico. French collector Peter Kaus acquired what was left in 1980 and restored those remaining pieces in his shop to original coupe form for his famed Rosso-Bianco collection. 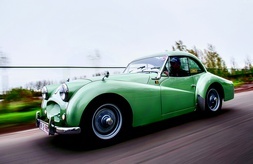 The car was purchased in 2006 by fastidious historian and collector Evert Louwman of the Netherlands. 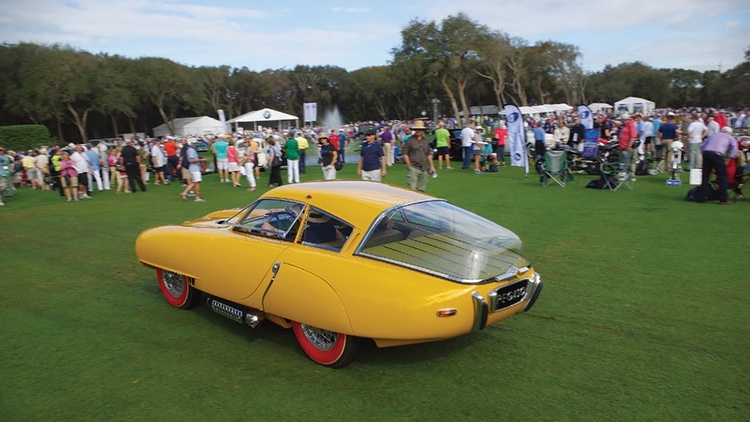 He then spent six years carefully disassembling and re-restoring the Pegaso coupe to its original 1953 New York Auto Show form. 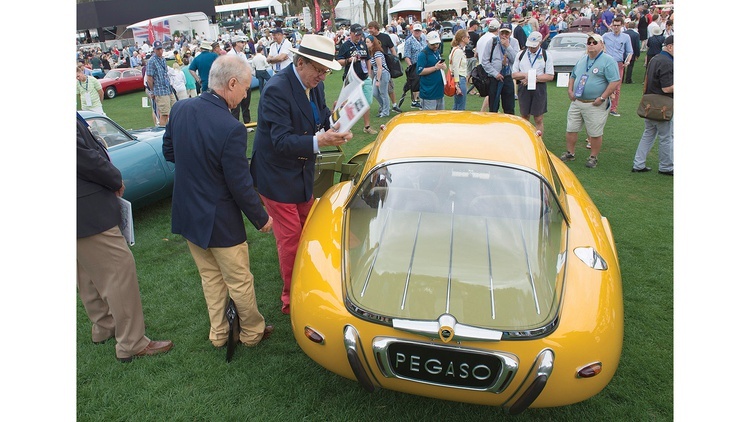 After that he began showing it in Europe’s top concours, and then brought it to America for the prestigious Amelia Island Concours in Florida. 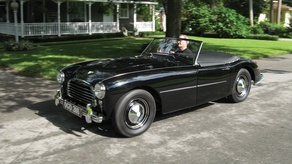 There the Cupula won one of the show’s two top honors, the prestigious Concours d’Sport. As it had in all its previous history, the Cupula also drew howls of protest from self-proclaimed design “experts” who completely misunderstood Ricart’s dream. As the quote popularly attributed to 17th-century philosopher Alfred Schopenhauer says, “Truth proceeds through three stages. First it is ridiculed, second it is violently opposed and, finally, it is accepted as self-evident.” All who’ve had the rare opportunity to gaze upon the Cupula’s unique lines can place themselves in one of the three categories. The Cupula, still one of the wildest, most exotic GTs ever constructed, now resides in The Hague museum in the Netherlands. But the most interesting sidelight on the whole project is how aerodynamically efficient this advanced shape was for 1952, when it was first completed. Wifredo Ricart had known and understood what the Germans had achieved some 20 years earlier. Another who recognized this genius was ex-Ferrari engineer Carlo Chiti, who had formed Autodelta, the postwar competition arm of Alfa Romeo. Chiti took the Germans’ aero data to master Italian coachbuilder Zagato, who applied the still-controversial lines to Alfa Romeo’s equally aero-efficient, Autodelta-built Giulia TZ1 in 1963. Gorgeous! In late 1957, while working for GM Styling, I discovered a technical paper evidently written by Koenig Fachsenfeld and Kamm sometime in the late ’30s, when their concept K-series models were being tested. But it wasn’t until late 1963 that I had the opportunity to apply this same data to my design for the Daytona Cobra Coupe. Today almost every production car in the world has some form of a “flat” roofline with a chopped tail–even the ubiquitous Toyota Prius. Join Free Join our community to easily find more Pegaso articles.